If this was a game that counted, it would have been an ending for the ages. Down in the 89th minute, Metro scored two late goals to defeat USL's Phoenix Rising, 3:2. Fidel Escobar had the winner off a Felipe free kick. 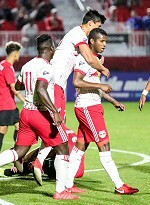 The hosts opened the scoring seven minutes in, when Aurelien Collin miss-hit a ball that looped over Luis Robles' head. (Let's hope it's just preseason jitters.) In the 37th, Metro evened it out, when Alex Muyl snapped a terrific header off a Kemar Lawrence feed. Metro controlled the game for almost the entire match, but, in the 71st, defenders allowed Phoenix to pass at will inside the penalty area. An unmarked Kevaughn Frater scored from a goalmouth feed. Vincent Bezecourt got Metro even with time winding down in regulation, pouncing at a ball at the top of the box and slotting it into the bottom left corner. Then, in the one allotted minute of injury time, Metro got a free kick at the very edge of the area. Felipe tipped it to Escobar, who blasted the winner into the net.